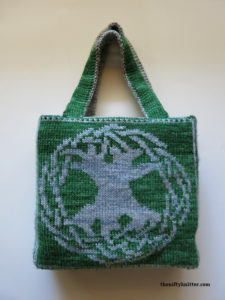 The Celtic Tree of Life Bag is a reversible double knit bag with a reinforced base and two handles. 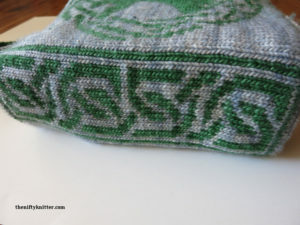 It features a beautiful Celtic Tree of Life on either side and a Celtic knot design on the ends. 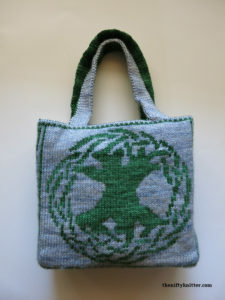 It works great as a project bag or for whatever you want to carry. Depending on your mood, you can turn it inside out to reverse the color scheme for a new look! 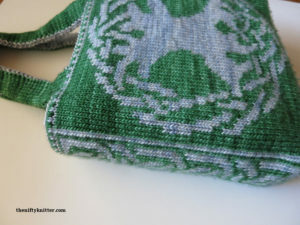 The finished size is approximately 11” by 10.75” by 3.5” (27.9 by 27.3 by 8.9 cm), not including the handles. This pattern includes full instructions for double knitting, so it’s a great project for anyone without previous double knitting experience. Approximately 325-375 yards each of two contrasting colors of aran weight yarn. Plastic canvas approximately 3.5” by 11” (8.9 by 27.9 cm) to reinforce the bottom of the bag (optional). Stitch markers in two different colors. Extra circular needle, flexible stitch holder, or additional scrap yarn.